You too can learn to fly a hot air balloon! If you have ever dreamed of learning to fly a hot air balloon, we just may have the perfect program for you! Give us a call and we'll talk! It may be easier than you think. A Student Pilot’s Certificate must be obtained before beginning training. Successful completion of training leads to a Private Pilot’s Certificate, lighter-than-air category with a free balloon class rating. After further training and experience a Commercial rating may be obtained, qualifying an individual to fly for hire, or to instruct. The following are the general requirements for Student, Private and Commercial Certificates. The following is extracted and simplified from Federal Aviation Regulations Part 61 - Certification: Pilots and Flight Instructors. A student must be at least 14 years of age. No medical certificate is required, but the applicant must certify that he/she has no known medical defect that makes him unable to pilot a free balloon. Student Pilot certificates may be issued by FAA Inspectors or Designated Pilot Examiners. 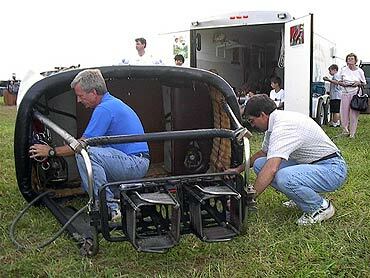 Student Pilots may solo after demonstrating to their instructor that they are familiar with Part 91 of the Federal Aviation Regulations, pass a pre-solo written examination, and are proficient in the following aspects of balloon operation: pre-flight preparation, operation of controls, lift-off and climb, descent and landing, and emergency situations. 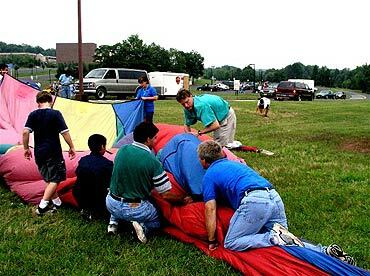 A Student Pilot may fly a balloon only under the supervision of a qualified instructor. He/she may not carry passengers or fly a balloon for hire. To be eligible for a free balloon Private Pilot’s Certificate a person must be at least 16 years of age. Read, write, speak and understand the English language. No medical certificate is required. Same as paragraph 3 above. The applicant must pass a written test on such items as: (a) Federal Aviation Regulations covering pilot privileges, limitations, and flight procedures, (b) use of navigational charts, (c) recognition of weather conditions and use of weather reports, (d) operating procedures with gas and hot air balloons. The applicant must have received instruction on the following pilot operations: (a) ground handling and inflation, (b) preflight checks, (c) takeoff and ascents, (d) descents and landings, (e) emergency conditions. 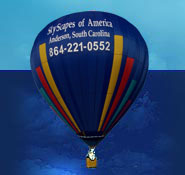 Flight experience must include at least 10 hours of flight instruction in free balloons, which must include at least 6 flights under the supervision of an instructor. These flights must include at least the following: two flights of a least one hour in duration within 60 days of the Practical Test with a Designated Pilot Examiner; one ascent to 2,000 feet above takeoff point; and one solo flight (these requirements are for hot air balloons, requirements for gas balloons vary slightly). The age requirement for a Commercial Pilot certificate is 18 years. No medical certificate required. Same as paragraph 3 above. The applicant must pass a more advanced written test on the subject matter listed in paragraph 4 above, additional operating procedures relating to commercial operations and those duties required of a flight instructor. Advanced training must received from an authorized instructor to include at least 10 hours of flight training in at least 10 flights regarding those items listed in paragraph 5 above plus emergency recovery from a terminal velocity descent. The applicant for a Commercial Certificate must hold at least a Private Pilot Certificate and have at least 35 hours of flight time as a pilot, of which 20 hours must be in a balloon. Flight time must include 2 solo flights, 2 flights of at least one hour duration within 60 days of the Practical Test with a Designated Pilot Examiner, and one flight to 3,000 feet above takeoff point. The holder of a Commercial Pilot’s certificate may operate a balloon for hire and give flight instruction. © Copyright 2004 SkyScapes of America. all rights reserved.